Hiking Rocky Mountain National Park: Mounts Dickinson, Dunraven, and the lakes of the North Fork River gorge. Mounts Dickinson, Dunraven, and the lakes of the North Fork River gorge. This was one of those very special days, with alot of time spent above treeline, visiting destinations that are so far in they don't get much traffic. We started our day in Lyons at 5. The drive up was mellow, with little traffic as you might imagine. We made it all the way to the North Fork trail head in only 45 minutes or so, spent a few minutes getting ready there, and were on the trail shortly before 6. I have to recommend you follow the signed trail, as we stayed on the road and accidentally trespassed. It seemed like we were making good time, but we were amazed when we stopped for our first snack break shortly after crossing into RMNP from Comanche Peak Wilderness and it was a few minutes after 7. We were able to maintain a pretty high speed throughout the day. We got to the Happily Lost campsite. From here on we shall be happily lost, the world of work and life's demands behind us. When we hit the creek, we spied a nice thick tree to provide safe crossing slightly upstream from us. On the other side of the creek, we started the bushwhack up and saw this toilet. I guess the privy which is now on the north side of the creek, was at one time, and more than several years ago, on the south side. Unfortunately, I did not have anything to add for posterity at this point of the day. And up, up, up we went, winding our way through the thick forest. Over and around dead fall, through knee height brush, over slippery and mossy rock. We hit a ridge, and stayed west of it at first. Then we sighted some clearer ground to the east and went toward that. The going definitely got easier as we approached tree line. Everything was wet and the day was relatively humid, perhaps contributing to the hazy appearance of some of the surrounding areas. We broke tree line and continued on. This part of the hike is relatively steep, gaining approximately 2200 feet in maybe 1.25 miles from the campsite to the summit. And then we were there, 11831 feet. Less than four hours to go 7.8 miles and gain 3931 feet. Not bad. Looking west towards Dunraven and the Mummy Range. We talked about some goals for the next year. Dan's is to run a 50 mile race. Crazy! Mine is to go higher. And back east to nothing and everything else. Longs Peak and friends cavorting to the south. The weather was great today, and I am guessing it saw a fair amount of activity. Even counting the two separate groups of 8 trail workers (a big thank you guys and girls!) , we saw about 25 people throughout the day. A Bob Rossian cloud hangs over the West Creek Research Natural Area. From here it's 2.2 miles and 700 feet to Dunraven, but you do loose about 160 feet, then gain back 600, then loose 300 before gaining the final 570ish to the summit. Low but nonthreatening looking clouds continued to play with the landscape. Back along the ridge from whence we came. Unfortunately, there was no writing implement in the register atop Dunraven, and neither of us had one along. Unblemished by my hand, but we were there. Looking back a little bit closer. On the top of Dunraven in one hour more, 12571 feet, photo courtesy Dan Regelson. 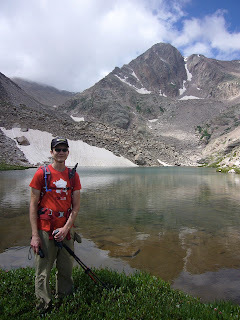 Our next goal for the day was Scotch Lake, high in the North Fork River drainage. In looking at the map, we determined that we could head directly toward it rather than descend. From the topo, the slope to the south of the lake looked a little steep to descend. We aimed for the snowfields pictured towards the base of Gibraltar Mountain, figuring this would allow us some flexibility to choose an appropriate route down. And that strategy worked, as we were able to pick a way down talus and tundra to arrive slightly below the lake. 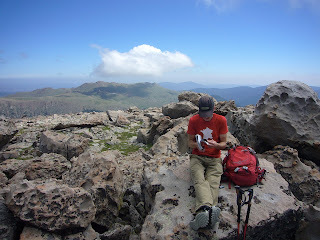 Both of the registers on the peaks led us to believe they get 10-15 ascents per year. It seems quite likely that these lakes see only that amount of traffic as well. Scotch Lake, again thanks to Dan. Looking down to Whiskey Lake. With names like these, I was getting quite thirsty. Whiskey Lake with Gibraltar Mountain and Middle No Name above. 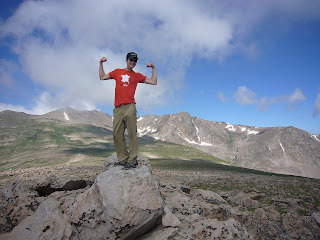 I am excited to stand atop those peaks and look down. Farther down we hit Lake Dunraven. From here we decided to hit Lake Louise. It looked like we might be able to contour around, but a rock face seemed to block that. We went over the rock face, and with the help of a game trail, were able to descend to Lake Louise fairly quickly. We were walking down from here to Lake Husted, and happened to turn back. Wow! One of the small, unnamed ponds below Lake Dunraven and Lake Louise. Lake Husted was going to be the one. 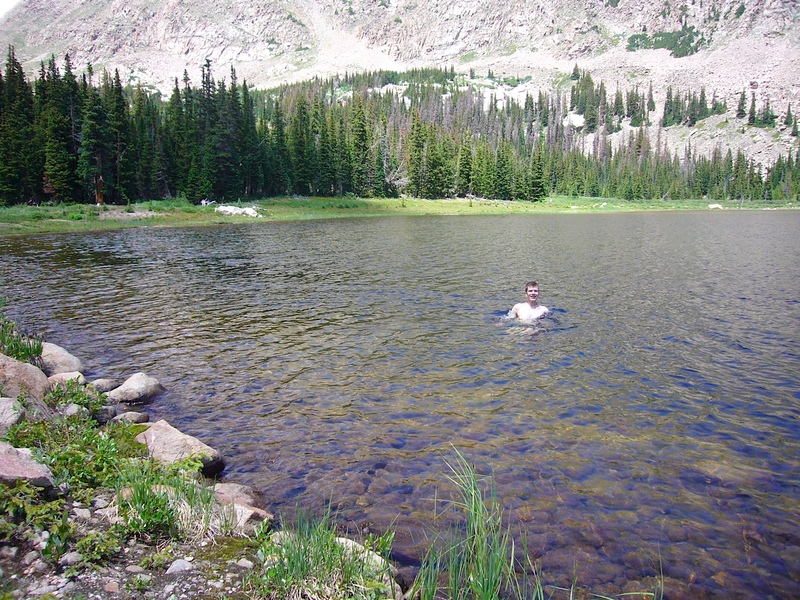 For years of hiking I've wanted to swim in a high altitude lake. 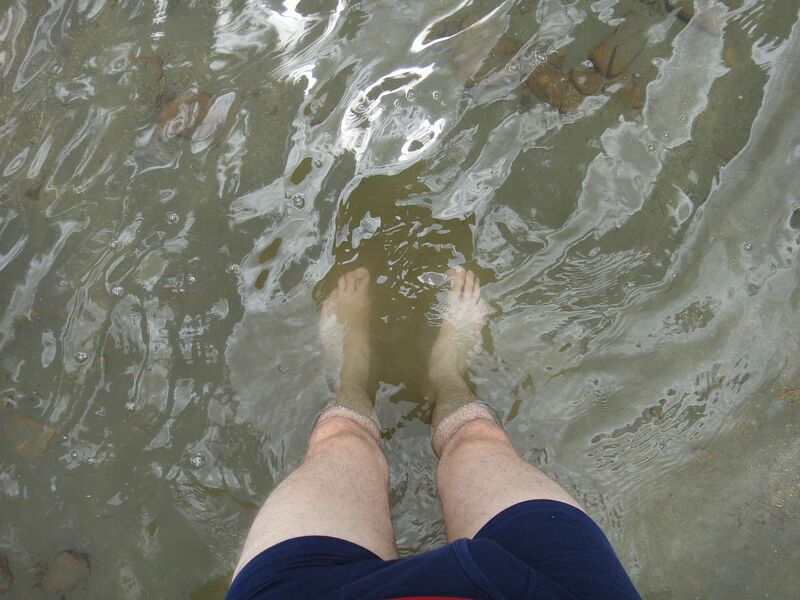 Last year I attempted Eagle Lake only getting knee deep before my feet lost feeling and I wimped out. 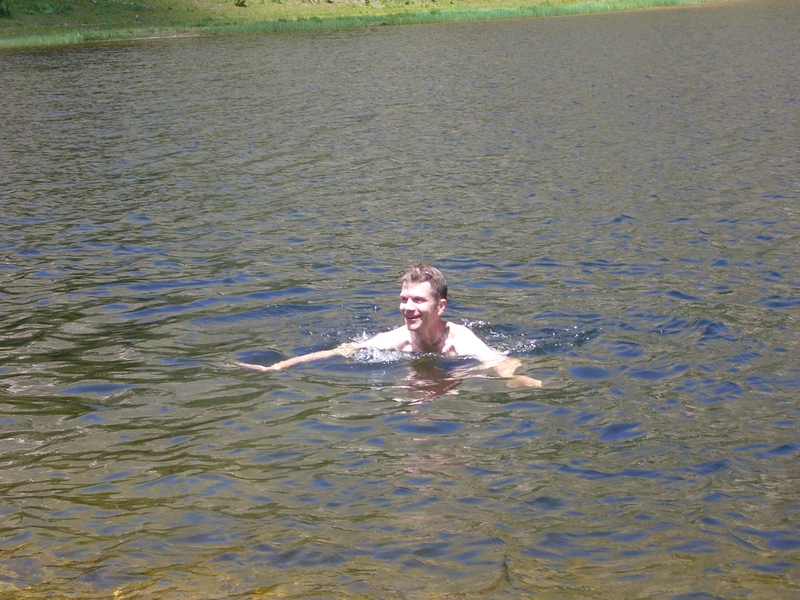 I knew I had to find a lake which I could just jump in. Unfortunately, this one looked pretty shallow and would require a good bit of wading to get to the deep part. Onward to Lost Lake. This was the one. Mount Dickinson seen from below. This was it, the line that divides mice from men. It was pretty cold, but very refreshing. I felt better throughout the hike having washed off the days sweat. We took a nice long rest here, refueled, talked. Ready for the 9.7 miles back to the truck, we set out. A must visit in my opinion. The with the gain/loss coming over such a long distance, the down part isn't too bad either. The cliffs to the north looked pretty cool, but just when we were in a bit of a clearing and I pulled out my camera, Dan waved me on, pointing back. Moose! Maybe 20 feet away, a cow. No babies in sight, and fortunately she was occupied with eating. Much less scary than my last moose encounter, but still a reminder that this is their home and we just share it. And that moose are huge animals! We got back to the truck right at 445pm, giving us just under eleven hours to do 24ish miles and 5700ish feet of total gain. Again, not bad, and the longest hike either of us have done separately or together, though we've both had 20 milers or so. If you know me at all, you know I live for days like this. I relish being in the middle of nowhere, seeing no one other than ourselves. This is the best place for reflection, admission, honesty. It is a privilege to set foot on a peak that might see only nine other people in a year. 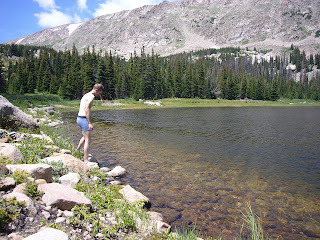 It is humbling to kneel at a lake, put a hand in the water at 11620 feet. I am already looking forward to my days off next week, anxiously checking the weather. This is where I go, what I do, and what I love! Mount Dickinson: 7.8 miles one way, 3931 foot gain (7900-11831). Strenuous-. Mount Dunraven: 10.1 miles one way, 4671 foot gain (7900-12571). Strenuous. 'Scotch Lake': 11.7 miles one way (from Dunraven th), 3720 foot gain (7900-11620). Strenuous-. 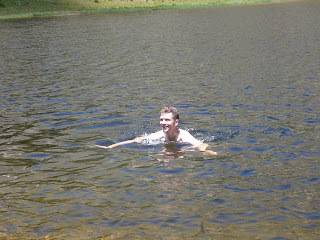 'Whiskey Lake': 11.5 miles one way, 3640 foot gain (7900-11540). Strenuous-. Lake Dunraven: 11.1 miles one way, 3360 foot gain (7900-11260). Strenuous-. Lake Louise: 10.9 miles one way, 3120 foot gain (7900-11020). Strenuous-. Lake Husted: 10.4 miles one way, 3188 foot gain (7900-11088). Strenuous-. 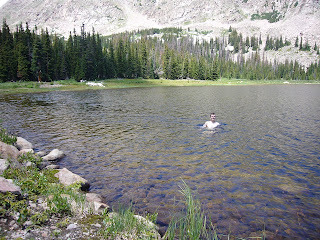 Lost Lake: 9.7 miles one way, 2814 foot gain (7900-10714). Moderate+.